William Johnson joined Moore Ingram Johnson & Steele in 1986 and currently serves as Administrative Partner. His areas of concentration are Civil Litigation, Insurance Defense Litigation, and Product Liability Defense. 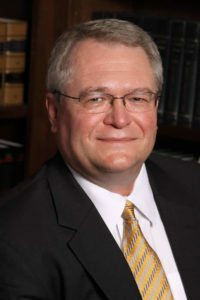 He has been a member of various insurance defense societies including the Atlanta Claims Association, Southern Loss Association, Georgia Self Insurers Association and served on the Executive Board of the General Practice and Trial Section of the State Bar of Georgia. He is also a member of the Managing Partner Committee at the Atlanta Bar which is available only to Managing or Administrative Partners at firms. Bill has joined the Claims and Litigation Management Alliance which is a nonpartisan alliance comprised of thousands of insurance companies, corporations, Corporate Counsel, Litigation and Risk Managers, claims professionals and attorneys. Selected attorneys and law firms are extended membership by invitation only based on nominations from CLM Fellows. Born in Atlanta, Georgia, January 11, 1958, Bill was admitted to the Georgia Bar in 1983 after receiving his Bachelor of Science degree with honors in Biochemistry from Berry College in 1980, and his J.D. with honors from Mercer University. Bill was admitted to the Tennessee Bar in 1999 and the Kentucky Bar in 2012. Formerly with the firm of Long, Weinberg, Ansley & Wheeler, Bill joined Moore Ingram Johnson & Steele to assist in the formation of a civil litigation department in 1986. Bill resides in Marietta and has three adult children and two grandchildren. Recognized as a Top Rated Lawyer Georgia Legal Leaders as published in the Atlanta Journal 2016. Recognized as the “Best of the Best” by The American Registry and awarded America’s Most Honored Professionals which is given only to the top 1% of professionals as voted by their peers. Awarded Top Lawyer Lifetime Member award from The Global Directory of WHO’s WHO. Selected for inclusion in the editions of The Best Lawyers in America, and in Georgia, in the specialty of Personal Injury Litigation – Defendants. Named one of Georgia’s Top Rated Lawyers in the area of Civil Litigation. AV Rated by Martindale-Hubbell for over 20 years including AV Preeminent in Legal Ability & Ethical Standards. Named a Top Rated Lawyer in Insurance Law for many years as published in The American Lawyer and Corporate Counsel. Top Lawyers in Georgia as published in the Atlanta Journal.